I started late for Mars this season. These images were taken with a C14 XLT on an AP900GTO mount. My camera is a Point Grey Research Flea3 monochrome camera. A Homeyer motorized filter wheel was used to produce an RGB image. I used an Astrophysics Barcon working at 3X. To capture I used FireCapture 2.1. 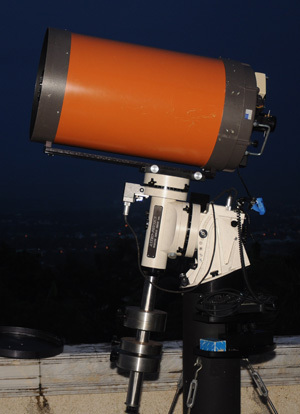 For processing, I use AutoStakkert and Registax V5 . Seeing was very variable this evening. The region is very similar to the region imaged last night. The Tharsis Volcanoes can be seen sticking out of the clouds on the left. Albedo features are not as resolved as yesterday's image. Seeing was excellent this evening. 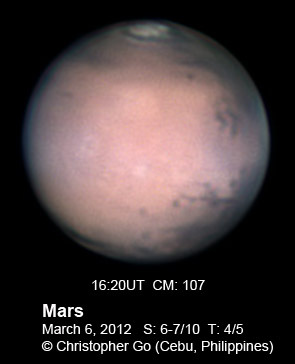 I imaged Mars when it was over 80 deg in altitude. This may be the reason why there is less artifact on these images. The Tharsis Volcanoes are very prominent on the left with the peaks sticking above the cloud top. Olympus Mons is rising. The north polar cap continues to recede. There are many details resolved on Chryse, Mare Erythraeum, Niliacus Lacus, and Mare Acidalium. Seeing was good this evening. 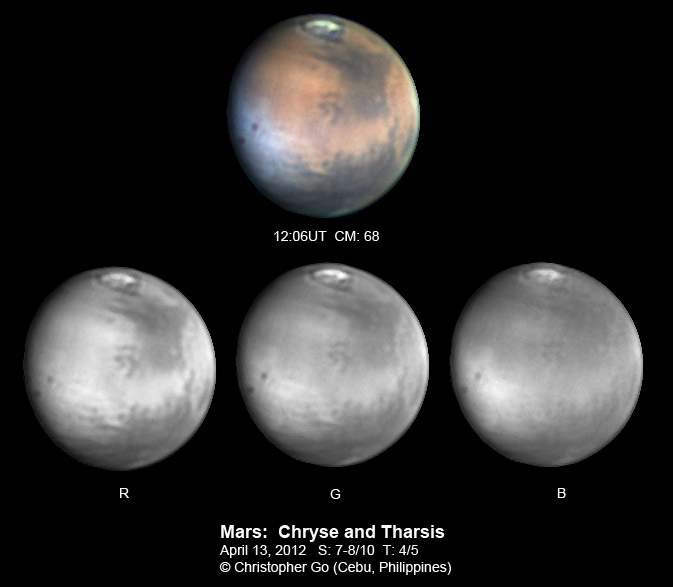 The Tharsis Volcanoes and Olympus Mons can be seen rising on the left and sticking above the cloud. Chryse is setting on the right. The north polar cap continues to shrink. Happy Easter everyone! Seeing was okay this evening. I used Winjupos Derotation on these images. Olympus Mons is the dark spot surround by the morning clouds. There are clouds around Daedalia. The Tharsis Volcanic peaks: Arsia, Pavonis, Ascraeus Mons are prominent in these images.. The North Polar cap continues to shrink. There is a bright ice layer outside the dark ring that surrounds the polar cap. I have finally figured out how to make a decent image of Mars. I had be over exposing my blue channel lately. Now I know how to control the channels! 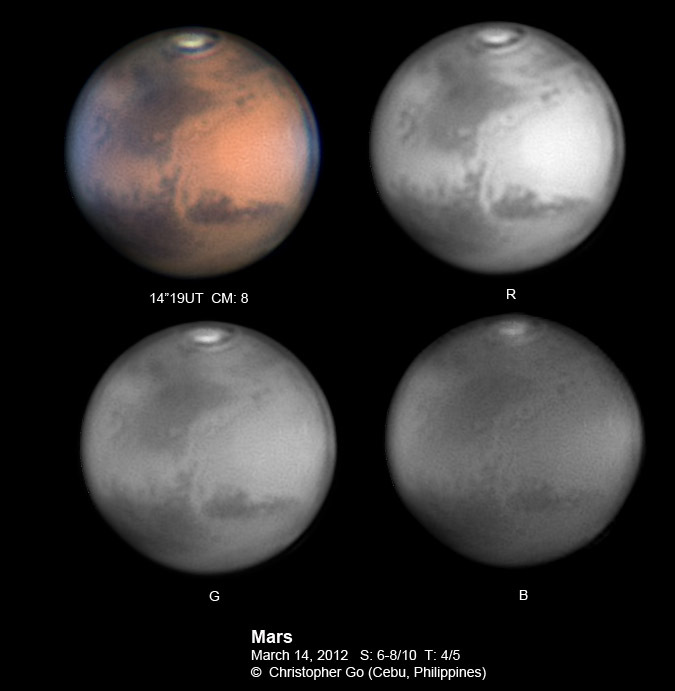 Seeing was good and these are some of my best images of Mars. Unfortunately, Mars is getting smaller and smaller! Because of the good seeing, I spent about 30min the other day just fine collimating my C14. 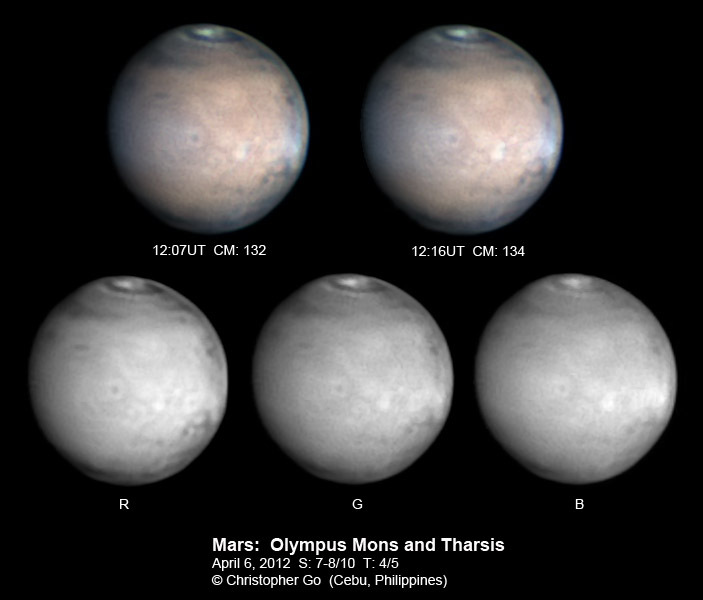 Olympus Mons is prominent in these images. The Tharsis volcanoes can be see but there are clouds in the area. The North Polar cap is breaking up into two. Finally had excellent seeing this evening. I used a Baader UV/IR blocking filter for these images. Olympus Mons is close to the CM at the center of Mars. It is the distinct dark spot on the center of Mars. 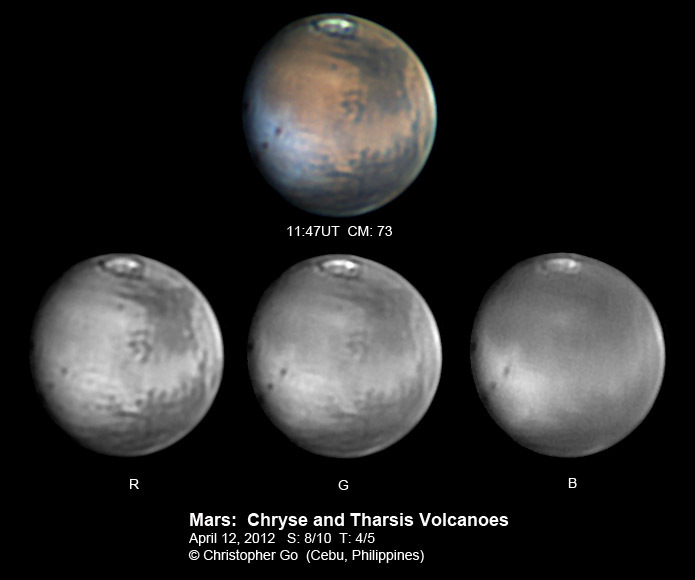 The Tharsis Volcanoes can also be seen with their clouds. The north polar cap is getting smaller. Seeing was a little better this evening but condition was still unstable. I used a Baader UV/IR blocking filter for these images. 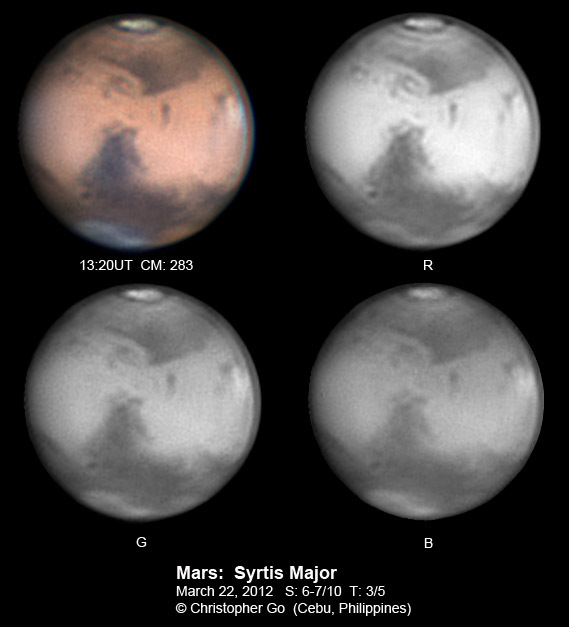 Syrtis Major is prominent. The Hellas region has very bright clouds. There are also bright clouds at Chaos. The North polar cap is getting small. Thanks to Christophe Pellier and Damian Peach for pointing out the IR leakage of my B channel. I got my Astrophysics Dielectric diagonal as my trusty UV-IR blocking filter. Seeing was good this evening. My images today is very similar to the image I took yesterday. Because of better seeing, more details can be seen and features are clearer. 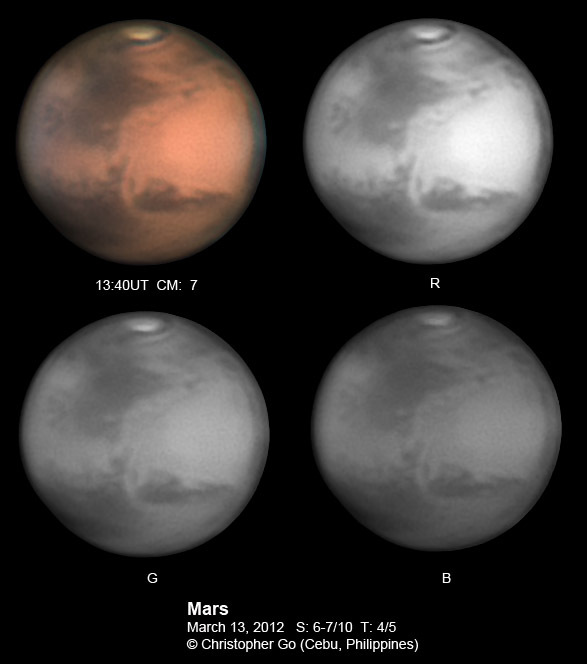 Clouds can be seen on both the eastern and western edges of Mars. The north polar cap is still a bit yellowish. Note the dark ring around the polar cap. I spent about an hour re-collimating my OTA this evening. Seeing was still unstable but the recollimated scope gave a more pleasant image. 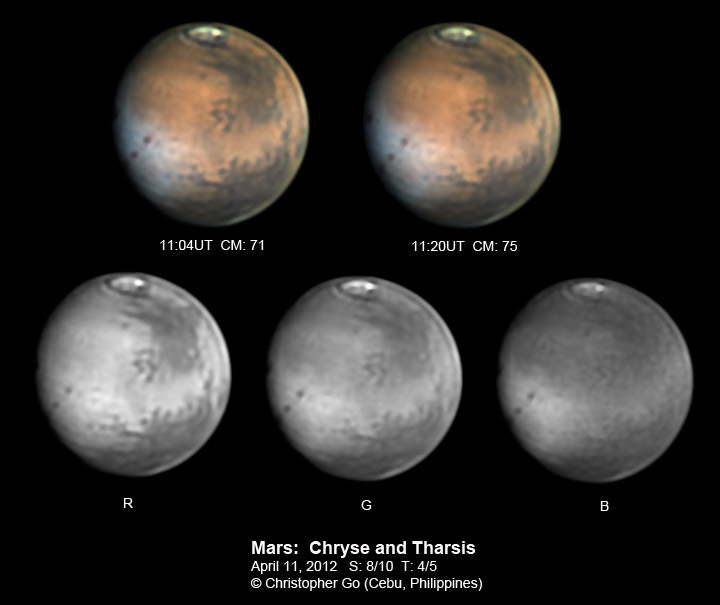 Mare Erythraeum and Chryse are rising on these images. Sinus Meridiani is at the CM. The north polar cap is getting smaller. Seeing was a little better this evening. Lots of details in Mars! Lots of details resolved in Mare Erythraeum. The streaks are fascinating. No wonder Giovanni Schiaparelli thought these were "canals". Valles Marineris start around the northern part of Mare Erythraeum. Do these streaks form part of Valles Marineris? Note the cloud on Argyre on the south. Sinus Meridiani is setting on the right. The Opportunity Mars Rover is currently in the western portion of Sinus Meridiani. Chryse is at the CM. 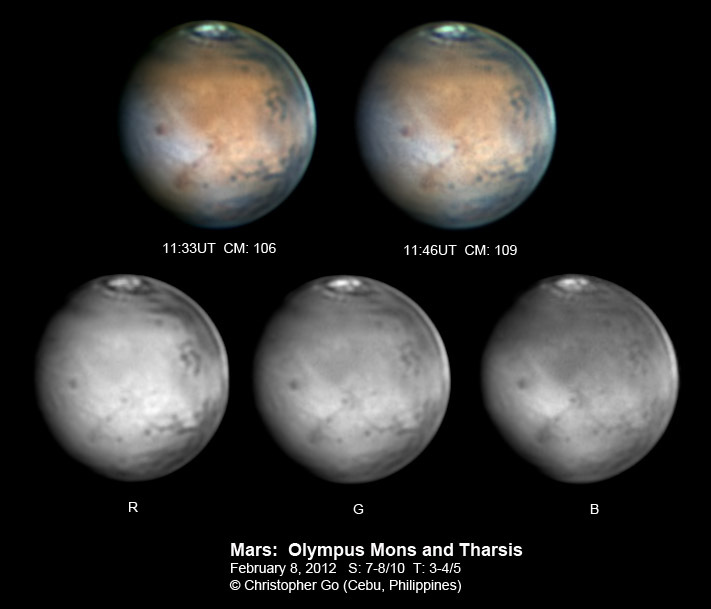 Note the morning clouds on Tharsis. The top of Ascraeus Mons can be seen peeking out of the cloud tops. The North polar cap seems yellowish. I tried to adjust color balance but can't seem to get it to become white. Is there dust on the pole? Chryse region is very prominent this evening. This is one of my favorite sides of Mars. The North Polar cap continues to shrink. Morning clouds are visible in the Tharsis region. Solic Lacus can be seen but difficult because of the current orientation of Mars. Seeing was a bit unstable today. There were clouds in the sky. Mars is less cloudy today. Olympus Mons can be seen on the center left. The Tharsis Volcanic Region is at the CM. Not a lot of clouds on top of the volcanoes here. Solis Lacus is setting on the lower right. The Northern Polar Cap is shrinking. Seeing was fair this evening. Finally able to catch Mars this season. The Tharsis Volcanic Region is prominent in these images. The largest volcano in the solar system, Olympus Mons can be seen at the center of Mars. The North Polar caps are breaking up. 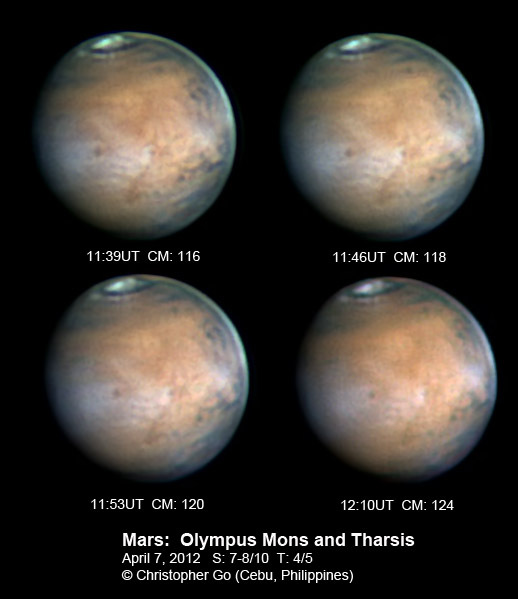 The clouds on the 3 Tharsis volcanoes are prominent to the right of Olympus Mons. Clouds are also visible on top of Arcadia.